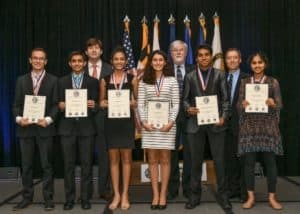 We are thrilled to announce the winners of the 56th National JSHS competition held in Hunt Valley, MD on May 2-5, 2018. 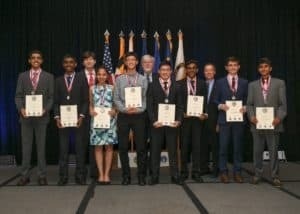 The 3-day event was organized and supported by the United States Army, Navy, and Air Force and administered by The Academy of Applied Science, a non-profit STEM education organization. 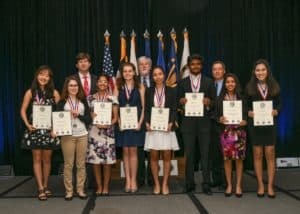 The National competition is the United States’ premiere showcase for STEM research by high school students. 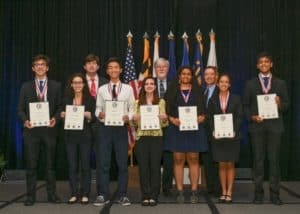 Students must first present their research at one of 47 regional competitions hosted by universities and colleges in the U.S., Puerto Rico, and Department of Defense Schools in Europe and Pacific. 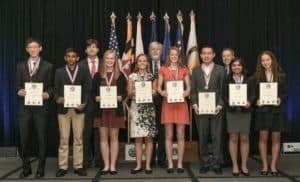 The top five students from each region were invited to participate in oral presentations or poster presentations at the national event. We recognized students presenting their research in poster format with first, second, and third place as well as a special peer review award. 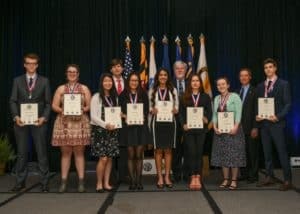 In the oral presentation sessions, three winners in each session category earned scholarships ranging from $4,000-$12,000. Congratulations to all of the students who participated in JSHS this year. We are honored that you made our program part of your high school experience!